Arouse your inner creativity. Listen to your creative voice. Explore where it takes you! Cancer – Any evil condition or thing that spreads destructively. These voracious, ravenous aphids extracted so many nutrients and vitality from some of our plants, that they became very, very sick. We saw more aphids than we had ever seen before in our yard, and as a result, we also saw more ladybugs than we have ever seen, attacking the cancerous aphids. As I wrote previously, we are in the middle of a frightening cancer battle. My mother was recently diagnosed with Stage 4 cancer…4 out of 4. What is Stage 4? Per our surgeon, it means cancer has metastasized from it’s original site to other organs. Each doctor visit and surgery result over the last two months brought worse news, showing more and more spread, and leaving us in an endless nightmare. The cancer is extremely rare, aggressive, and high-grade, for which there is NO standard treatment and no clinical trials because of its rarity. There is no known cause. It is not curable. The prognosis is……….well….…all I will say is that people have been known to beat the odds and we are hopeful and determined that she will beat it. It is a very scary time. Cancer treatments began this week. Two weeks ago, we made a quick trip to another high rated cancer hospital for a second opinion, and were more assured we are headed down the right path with her initial treatment plan. Because of the cancer’s aggressiveness, we needed to start as soon as possible after recovery from her last surgery. The treatments are a rigorous regimen of two days of chemotherapy every two weeks for a minimum of six months. It’s too soon to see what the actual side effects will be since everyone reacts differently to the drugs, but we know what the common side effects are. Hopefully the treatments will turn out to be a swarm of ladybugs focused on and succeeding in obliterating the cancer! Again, I will not be as active in the blogging world but will do my best. Thank you for all of the wonderful well wishes you continue to send for my mother and for staying with me through these tough times. This week’s WordPress Photo Challenge is Point of View. I’ve used the theme in two ways – one in the photo itself, and one regarding focused treatment. This entry was posted in Uncategorized and tagged art, cancer, cancer treatment, haiku, health, insect, macro, nature, photography, photos, poems, poetry, postaday. Bookmark the permalink. I have been missing you and did not know about this..Sending prayers for you and your family.. I wish all the best for you mother. May she recover well! Sending prayers and well-wishes to your mom. I can’t imagine how hard this is. Beautiful photograph and I do believe in miracles. Amazing shot. I’ve never see a ladybug eating something before. If only beating cancer was as easy as putting ladybugs to work (we call them ladybirds). I hope your Mother is comfortable and not in any pain. I guess that, (and a miracle), are all that we can hope for at the present time. Thank you so much for the update. Thank you for thinking of your blog friends while facing such a turbulence time of your life. My prayers and thoughts are with you and your mother. Sending your mom and your family good vibes and lots of prayers, Fergie. Stay strong. Wow! First your shot of the ladybug and aphid is just so amazing. Such great detail. Second sending prayers your way for you and your mom during this time. I believe that your mother will be better. Thanks for updating. My heart goes out to you. My daughter was diagnosed with a rare cancer five years ago and went thru major surgery, so I know what a difficult, scary time this can be. Your image and the accompanying metaphor speak volumes. All the best to your mother … and YOU. I’ve changed blogs so you might not recognize me. I was blogging as buddhafulkat before, but now I’m applenpear. I just want to say that I wish your mother a speedy recovery and good health for both of you. Ah, my dear FM, how beautifully put with the swarm of ladybugs… so this is my wish too, from my heart. The news about your mother are very hard to comment. But I see that there is a lot of determination in your battle. We hope that drugs are such as ladybugs that kill cancerous aphids. I hope you can win your battle. We’re all here, take care. Sending good karma your family’s way — how stressful, hoping for the best! “…a swarm of ladybugs focused on and succeeding in obliterating the cancer” – a great image to keep in mind as your mother undergoes treatment. I wish her all the best. Such a great visual of what we pray happens to that nasty cancer business your mom is enduring. Healing prayers sent for her and your family as you walk through this hard time. Great photo! I will keep you in my prayers. My thoughts are with you and your mother. May she get well soon and you stay healthy being her support! Wow! That shot just blows me away! You and your family are in my prayers. Strength for you, and health for your mother, may the chemical ladybugs do the job! That is a very clear and informative photo, i know they eat aphids but not as clear as that. I pray for the best to come to your mother and your family. The analogy of the photo with cancer is very strong. Take care everyone. What cancer is with your mom? A stunning shot and wonderful metaphor Fergie. Praying those cancer cells are blitzed into oblivion soon. Sending positive, healing thoughts her way. Take care. hang in there, dear Fergie. sending lots of love and hugs from across the miles for you and your mom. Blessings on your mom and everyone involved in her treatment (and family, of course!!) The photo is wonderful! The shot is incredible Fergie!!! Take a lot of care…Your mother will need you! Blessings to you and your mom. And kudos to you for bringing your creative powers in to help with the fight! I am sending blessings and prayers to your mother and your family. 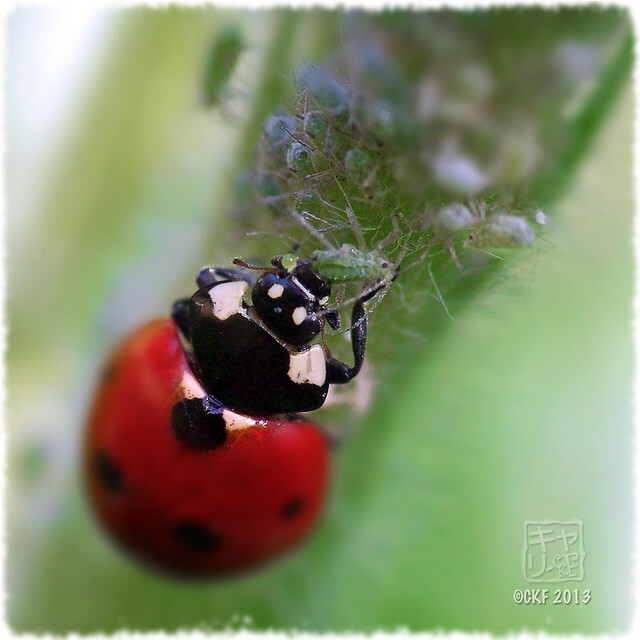 My own mother loved ladybugs, so whenever I see one, I will send a special prayer for your mother’s health as well. Great capture for this challenge! Ladybugs are so beautiful and natures cure to a lot of plant infestations. Amazing picture! Sending warm wishes and prayers for your mother and your family. Cancer has taken far too many wonderful people. I wish you and your mother much strength in battling it. And this is a gorgeous photo. Beautiful photo of the ladybug to go along with a positive thought of hope. I wish you and your mother the best and hope all of us praying with you brings her hope and success beating the cancer. I wish you all good things. Best wishes to you and your mother. Take care. Still thinking of you Fergie. Sorry I’ve been scarce here, but often think of you and wondering how your mother is doing. Love and prayers to you both. All text, photographs and images are my original work unless otherwise noted. All rights reserved.